In the early days of blogging, I often wrote about book prizes. At that time I trusted the aura of a shortlist, drawn by what I assumed was the light of Literature shining down and carving deep relief into the profile of an otherwise flat novel. But I also often complained precisely because once read the books themselves didn't seem to deserve such attention, while others that did were ignored. After a while, in fact after serving on a jury, it became clear that I was fascinated instead by the aura of the impersonal force of a collective honour rather than in the books themselves. The books themselves are incidental, as a glance at the titles of previous winners will confirm. For me the aura now illuminates only the book equivalent of the picture of Dorian Gray decaying in an attic while below literary professionals in brightly lit rooms swoon over its prettified worldly companion. Yes, prize-winning literary novels are a genre in themselves: rhetorical exercises, inbred descendents of mummified classics rather than sui generis acts of writing. Nothing to see here. But sometimes the shock of what prizes overlook is a revelation. Last week the Independent Foreign Fiction Prize longlist was announced. 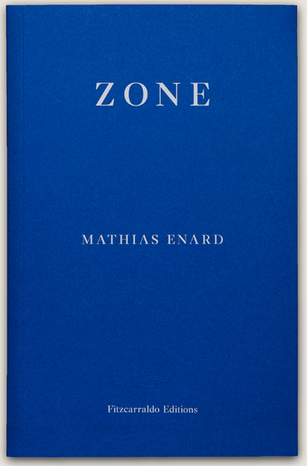 At the time I took even less notice than usual, indifferent to the predominance of predictable titles and their keeny blurbs, but I then discovered that Mathias Énard's Zone, published by Fitzcarraldo Editions, was eligible and had been entered and yet is not featured. This astonished me. I found out only because its absence prompted an unofficial shadow jury of bloggers to add it to their longlist. For a detailed review, see Max Cairnduff's, which includes links to other coverage. The shock is a minor one and this is not a post to complain of its omission or to speculate on the competence of the judges – in 2013 the prize didn't go to Vila-Matas' sublimely light Dublinesque, so hope has long flown – and instead to wonder if the failure of such novels to walk away with such a title is a sign of the necessity and vitality of non-genre writing, in which form and content struggle into existence on their own merit rather than rushing to adopt a generic mould for safe passage, and that it is only committed amateurs on the sidelines, those not on a career path or with corporate sponsors to appease, who are able to subject themselves to the full force of writing as a presence in itself. In a way, when Molloy, then Malone Dies first appeared in France, it was naïve of us (Georges Bataille, Maurice Nadeau and myself) to hope to alert the Prix des Critiques to these texts, even though so many remarkable writers and critics were on that committee, admittedly still as members of the 'literary establishment', when it was clear that even Beckett's early books were foreign to the resources of 'literature'. And, after his death, Anthony Burgess predicted Beckett's reputation would descend, no doubt as a sign that his renown was an aberration in literary appreciation. In his posthumous tribute, Blanchot seeks to distance Beckett from the greats to whom he is compared in obituaries (Proust, Joyce, Musil, Kafka), regarding his work (but "there is no work in Beckett") as something less (or more) than literature; that is, what I call non-genre. So we might dwell on that phrase Foreign to the resources of 'literature' and wonder what it might mean when browsing the conveyor belt of recommended good reads. Without doubt Dublinesque and Zone are very literary novels in the obvious sense: full of explicit allusions – the first to Beckett himself, the second to Apollinaire's poem Beckett had translated – but literary in another, less recognised sense too. As my review of the latter argues, the value and meaning of writing is never a given, is always under question within the work itself – is indeed an accelerant for its own flame – and its gifts doubted or resisted even as they are received. Of course, as Beckett's example suggests, even the most resistant to the gifts only burden us with more, becoming a resource itself, with the lamentable genre label Beckettian. Blanchot's claim, however, is Beckett's writing is "simply an attempt to keep within the limits of literature that voice or rumble or murmur which is always under the threat of silence", which might be a voice from the inside – "When you listen to yourself, it's not literature you hear" – or something from the outside – which is how I read the first two volumes of Knausgaard's My Struggle. So the paradoxical imperative to speak when speaking drowns out the murmur is the great challenge for whoever senses its demand; a challenge that might (still paradoxically) require passivity and weakness rather than mastery and strength, and perhaps inevitably, necessarily, wonderfully never prize-winning.